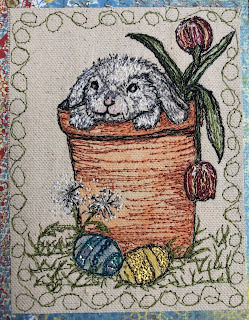 Years ago, I made a cute little Easter centerpiece using a small red clay pot, a little felt, and a few fluffy pom-poms purchased at the craft store. I know you have seen them....the felt and pom-poms are glued to the side of the clay pot to make it look like the bunny is head first into whatever you are displaying....candy or flowers. 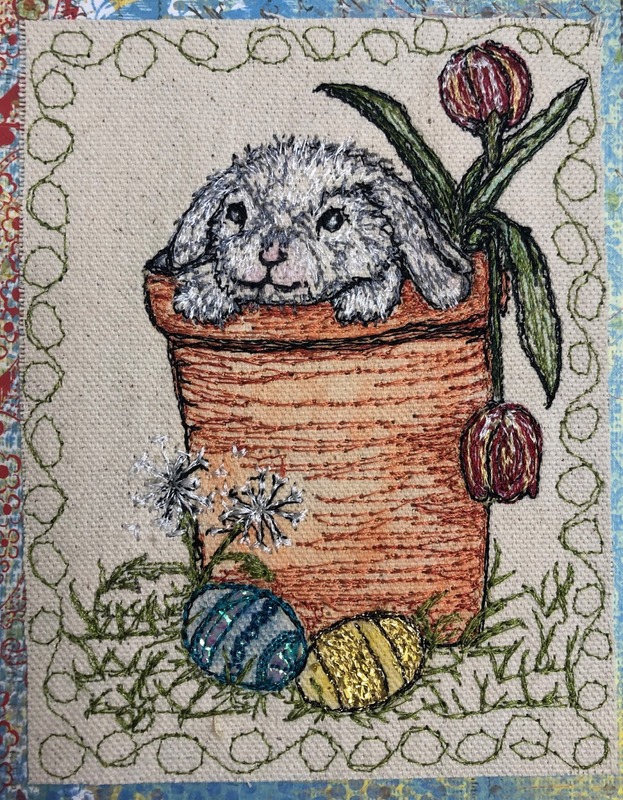 I recently came across a picture of one posted online, and it inspired me to make Easter cards with bunnies in pots. I had no other projects in the works, and thought it might be a good time to experiment. 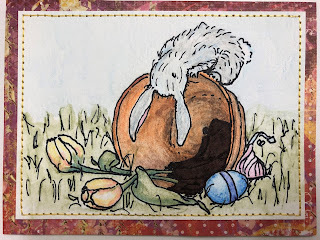 I added mylar, fluffy yarn, chalk, and a water color pad to my normal routine. 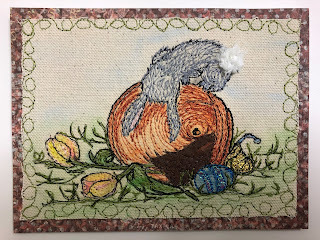 I had not originally intended to blog about the Funny Bunny Easter cards, so there are only a few in-progress pictures. Hopefully, it will be a light on words and heavy on inspiration! I have been playing around stitching mylar. It is a common practice when using a machine embroidery module. Until recently, I had never tried it with free-motion. My favorite mylar is a transparent opalescent. 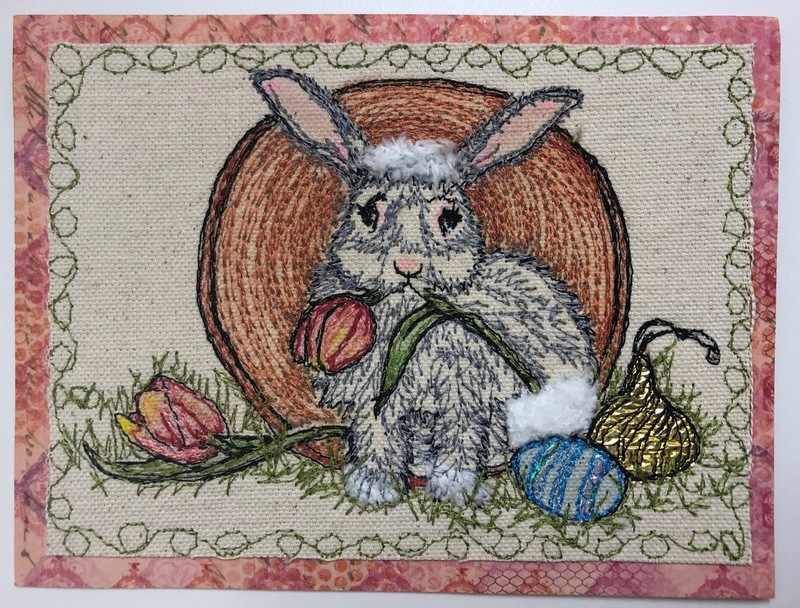 I could not find it locally, so purchased a single sheet from Etsy shop StitchednFaith. It seemed expensive, but it turned out to be well worth the price. I have made several cards and still have quite a bit left, so you will be seeing it in future posts. 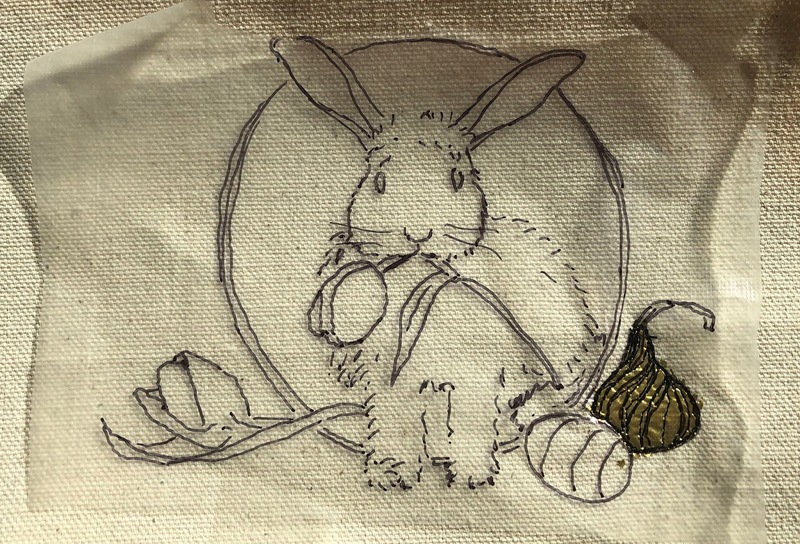 For the thread-sketched Easter cards, I used a combination of gold and the opalescent. The gold is opaque and requires a little more handling, as demonstrated here. 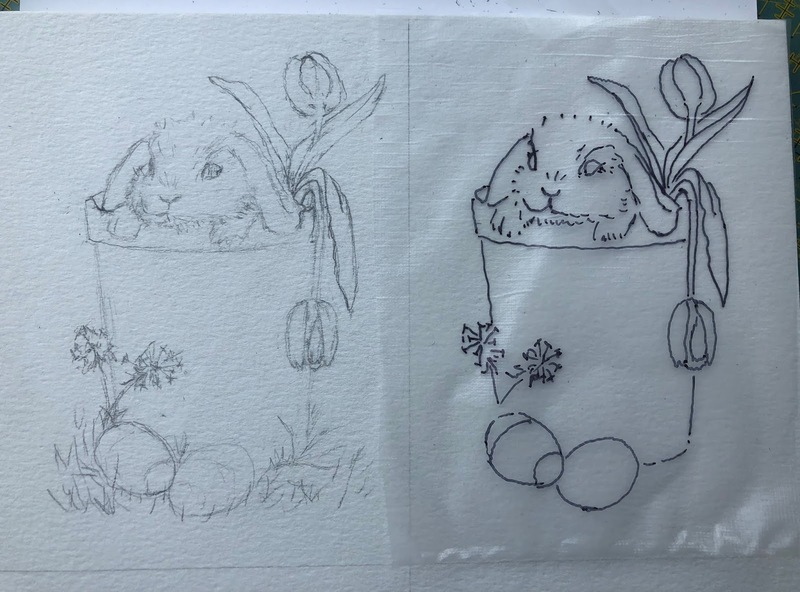 After drawing the image on my sketch pad, and transferring the image to water-soluble stabilizer, I cut a small piece of mylar to fit where the large candy Kiss would be stitched. I added the gold mylar first. 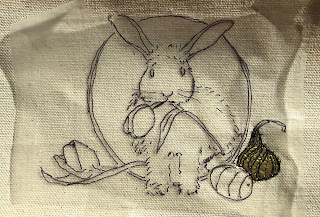 It is opaque making it impossible to use the stitched lines as a guide. 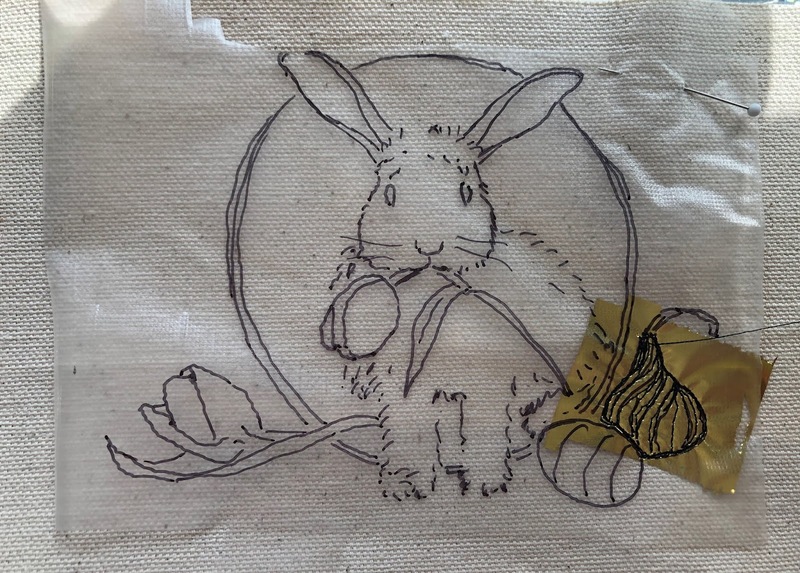 I will mention here that this bunny was originally drawn on my regular sketch pad. I eventually drew it again on the water color pad for the painted bunny. More about that later. The candy Kiss was stitched first. 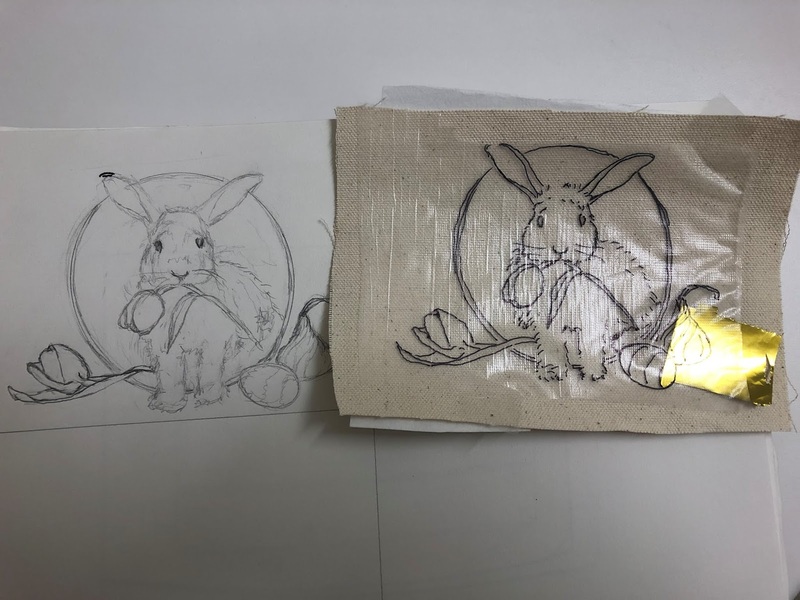 Before stitching anything else, the excess mylar was removed so it would not interfere with surrounding objects. I carefully lifted the water soluble stabilizer, removed the excess mylar, and continued stitching the rest of the image. 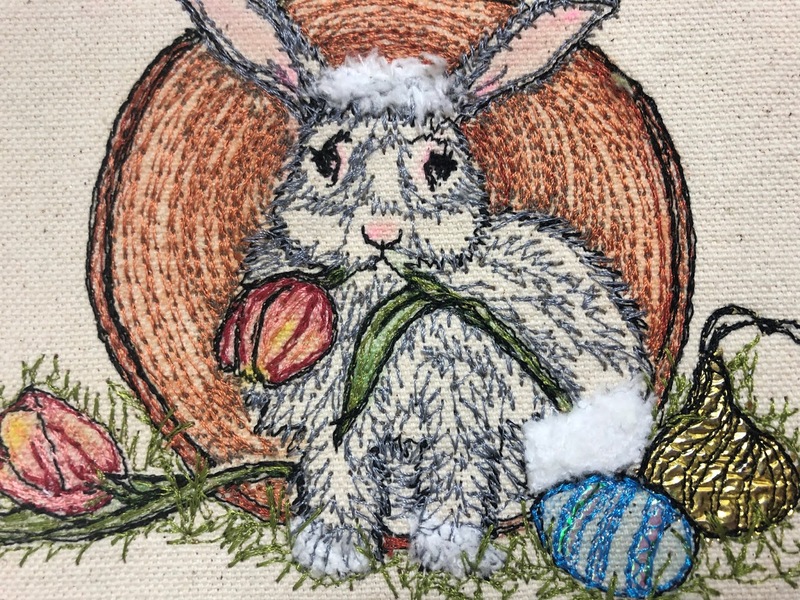 After transferring the outline to the canvas, I filled in with colorful thread. A bit of the opalescent mylar decorates the Easter egg. Fluffy yarn was stitched to the head and tail. After stitching was completed, a small paint brush was used to add a little pink chalk to the ears and face, and yellow chalk to tulips. 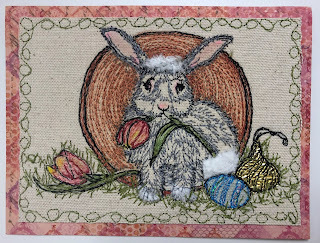 As with all my cards, the canvas and card stock border are affixed to 4-1/2 x 6 inch folded greeting card. 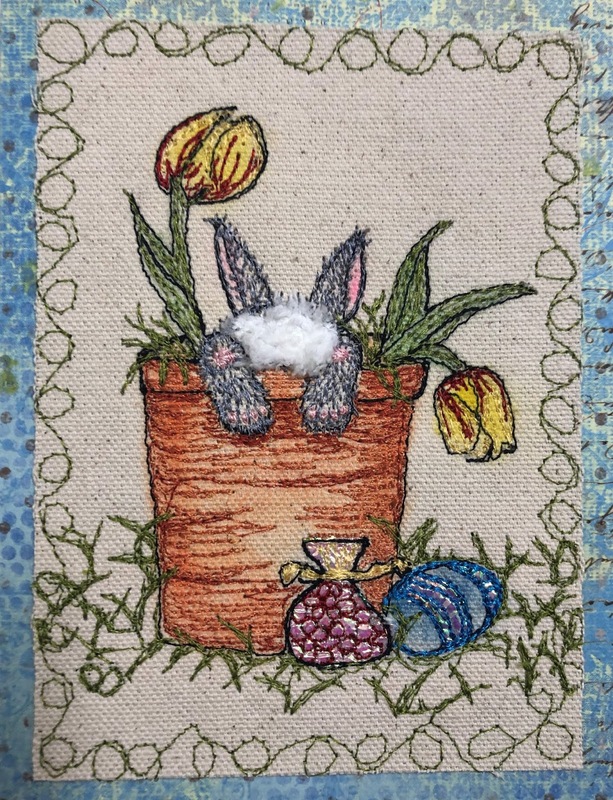 The stitched card is done, but the fun is not over! 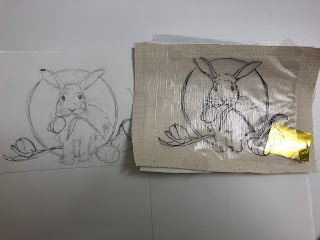 When I first started free-motion thread sketching, I used scratch printer paper to sketch, or in some cases, trace the images. As I became more comfortable with drawing, I switched to sketch pads, now filled with hundreds of images that I will probably not use again. I recently purchased a water color pad at our local Blick store and decided this would be a good time to give it a try. Double the fun regardless of how well they turn out! 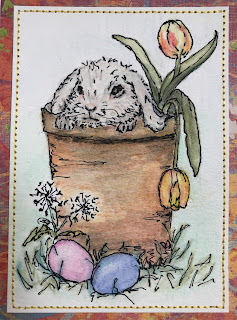 If it works out, more cards and fewer sketches cluttering my sewing room! There were some gotcha's for me. First, I use a lot of eraser on my sketches. 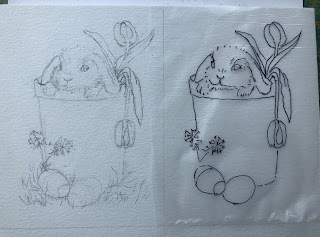 The erased lines and damaged paper do not affect the end product when I am transferring the image to stabilizer. However, my sketches need a lighter hand and very little eraser to keep the water color paper in-tact for paint. This sketch was made on the water color pad. Even though I tried to keep the pencil light, there were areas where I got carried away. Because I like to draw over the pencil in ink, the dark lines do not matter as long as I do not erase. I currently have only water color pencils because that is what I like to use on my canvas thread sketches. However, It was my experience that the water color pencils took a toll on the water color paper. Perhaps, again, it was my heavy hand. Although happy with these first efforts, I am anxious to try regular water colors. 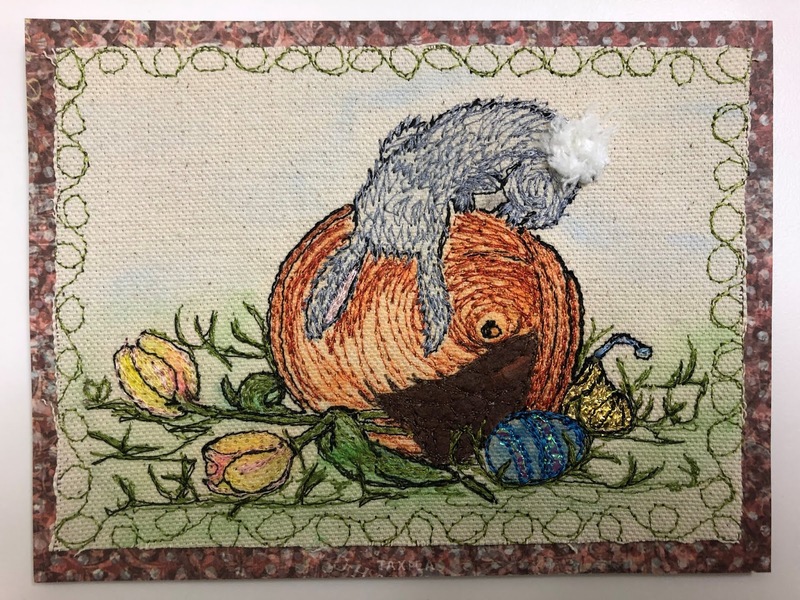 Since fraying is not an issue with the water color paper, a clean, simple stitch works to adhere the card to the border card stock. 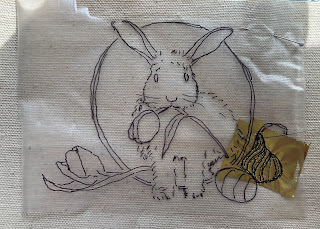 Here is the same sketch stitched in thread with a little chalk accent. 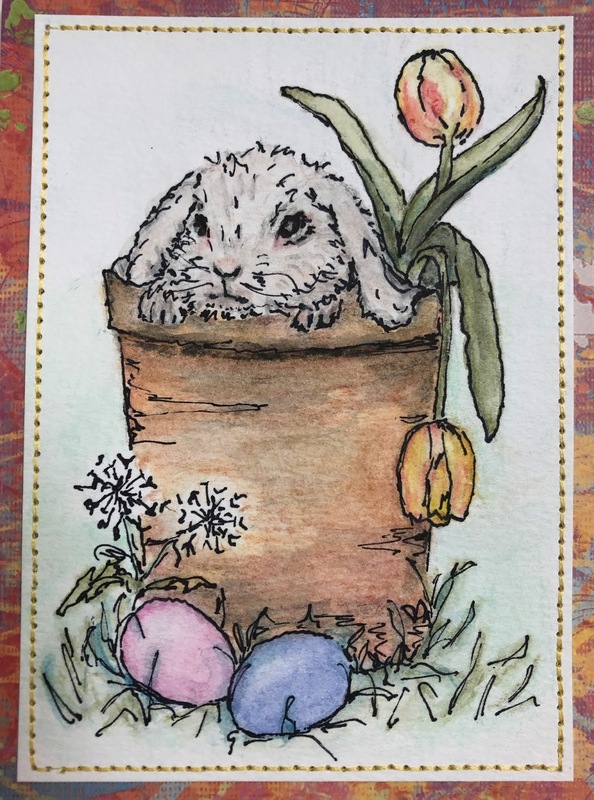 For each sketch, two cards and a lot more fun! There are four water color cards available on my Urban Stitcher Etsy Shop! A video featuring the cards can be viewed on my YouTube channel.